Dave Mustaine has gone as far as to the liner notes in Deths albums in admitting that the fact that Countdown To Extinction reached “only” number 2 in the Billboard album charts seriously pissed him off (even though he was seriously happy for everything else the success brought him), and that after that he only tried to reach that harder. This frustration is evident on the follow-up, Youthanasia, in the good and the bad. For the good part, Mustaines voice is very tight and sounds brutally committed throughout the record. It suits the well-written tales of moral and political injustices to an S. But the songwriting on many occasions seems forced and uninspired, as if the almighty chart hit was too severely in the sights. Reckoning Day and Train Of Consequenses rip the album open quite effectively with their chuggachugga-riffing while the bit more insignificant rocker Addicted To Chaos runs along without much hooks, despite the grandiose and excellent drum intro. The next tale of pain, A Tout Le Monde, luckily lifts the bar up a few thousand notches, as it absolutely is one of my favourite Megadeth songs. The song writes up a suicide note so melodic and emotional (complete with Friedmans marvellous soloing) that even I cant help but momentarily search for a noose or knives nearby - a magnificent ballad. The self-destructive thoughts wane out when Elysian Fields and The Killing Road give some spankin-good, a bit more speedy riffing on the record, that is partially plagued by too slow tempos. Marty Friedman saves a lot on this album, as his melodic solos give the songs needed colour and feeling. May the Metal Gods bless his playing, even today when he´s mainly committed to J-Pop. Blood Of Heroes, Family Tree and the title track work as nice mid-paced rockers in the latter half of the album, but that sadly concludes the mention-worthy, good material on the disc. The rest of the songs aren’t bad, but the just lack the hooks or that famous “something”, that would make me listen to them again. Although the album closer Victory is a pretty funny track lyrically, as it mentions at least half of the songs from the Megadeth discography, in one context or another. The production is stellar all around, with extra credit to be given to the crushing drum sounds of Menza. 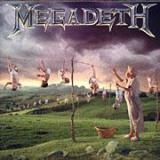 As a whole, Youthanasia locates itself in the middle of the Megadeth series by quality. It is by no means a bad record, but one that has plenty of good and almost equally filler – a very skilfully made basic record that has its shining moments here and there.